Here are some facts about the Leaning Tower of Pisa. The famous Leaning Tower of Pisa is located in the centre of the Italian town of Pisa. Pisa is in the Tuscany region, about 60 km from Florence and 334 km from Rome. The tower is the free standing bell tower of the city’s cathedral. It was built over a period of almost 200 years, with construction starting in 1173. The tower is almost 56 metres high and has 296 steps to the top. The walls are 4 metres thick at the base, and 2.48 metres thick at the top of the tower. 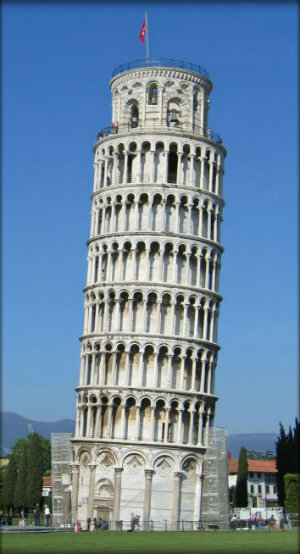 Nobody knows for sure who built the leaning tower. In all probability, it was Diotisalvi, a local architect, although archaeological findings do not completely support this. The circular tower has 8 floors, made from lime mortar and limestone. The outside of the tower is covered with marble and decorated with arches and columns. Almost as soon as it was built, the tower began to lean because of a poor foundation. Various efforts have been made to stabilize it and today the top of the tower leans almost 4 metres. Many ideas to straighten the tower have been suggested over the centuries, including dismantling it and moving it. The tower is slightly curved because of all the efforts to straighten it. Pisa took its name from a Greek word meaning marsh or swamp. Because of the unstable land in the area, the nearby cathedral and baptistery are slowly sinking. There are 7 bells in the tower, all tuned to musical scales. The heaviest of these is 3,620 kg and at one time it was believed the bells were causing the tower to lean.Although the Leaning Tower of Pisa is the most famous, there are several other leaning buildings. Germany has 2 leaning churches, and in Abu Dhabi, the Capital Gate building was designed to lean at 18 degrees.